Harrogate Mum, Linzi, has been raising funds for her eight-month-old baby son, Jake, who suffers from flat head syndrome, a condition also known as Plagiocephaly. Thirty-six-year-old, Linzi, who has two other children, began her plea for help from the local community over six weeks ago. She needed to raise nearly £2,000 to be able to take Jake to the Technology in Motion Clinic in Leeds to have a special helmet fitted that is proven to correct the condition. Six weeks on, a triumphant Linzi has managed to raise a fantastic £2,500 and has set up a fund at the clinic to help other parents who are faced with the same dilemma as her and husband Paul. She said; “We have arranged so many activities over the last few weeks including a sponsored walk, cake sale, and a number of raffles. We have been touched by the generous spirit of the people of Harrogate. 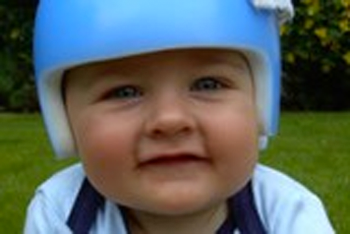 At just three weeks old, Linzi noticed that her son’s head was flat on one side. Linzi expressed her concern to the midwife, who advised her that she was sure it would correct itself and not to worry too much about it. It was here that Linzi and Paul were told that Jake was suffering from Plagiocephaly (a flattening of the head on one side). They were advised not to worry about the condition, and told that once his hair started to grow nobody would notice that his head was misshapen. Hugely dissatisfied with this approach, the Walkers turned to the internet for research and friends with babies for support. Online, Mum Linzi learnt more about the condition and the cranial remoulding treatment available. Jake is in week five of his treatment programme. He has to wear the helmet 23 hours a day but has taken to it very well. The team of clinicians have already seen improvements in his head shape.